Test your knowledge by taking the Pest Prevention Pop Quiz! One (1) Silver USB Portable Charger – We know you’re on the go from sun up to sun down and you can’t afford not to be accessible. This emergency charger is small, sleek and can help your phone keep up with your busy lifestyle! One (1) Double Wall Stainless Steel Travel Mug w/ lid - Your car isn’t the only thing that needs fueling up in the morning … this stainless steel travel mug is a great way to ensure your morning coffee is always within arm’s reach. 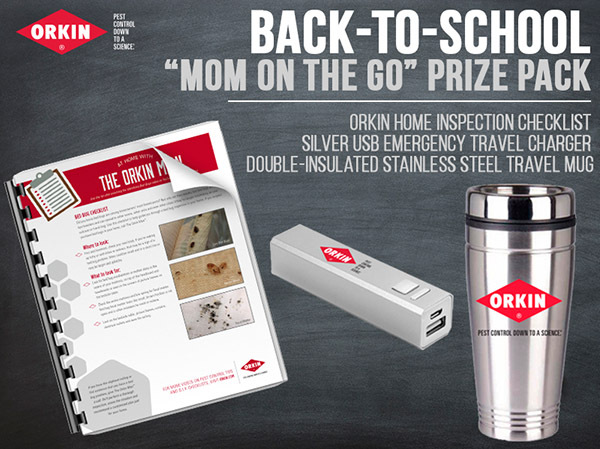 One (1) Orkin “Protect Your Home” PDF Checklist - This handy checklist from the experts at Orkin will help you think like a pest in order to help protect your home from pests. Enter by September 10th. US entries only – no P.O. Boxes. Each household is only eligible to win Back to School Prize Pack via blog reviews and giveaways. Only one entrant per mailing address per giveaway. If you have won the same prize on another blog, you will not be eligible to win it again. Winner is subject to eligibility verification. In accordance to the FTC Guidelines, I am disclosing that I received a prize pack to facilitate this giveaway. I was surprised at all the places you can find bed bugs! I was surprised to learn just how small of spaces mice can fit into! The facts about flies makes me feel sick! Yucky. I had no idea about the flies oh my.